How do I string my new bow ? Where can I find arrows for my bow ? Why doesn't the string fit, it seems too long ? Who is the maker of my earrings? What is the legal weight limit for hunting with a bow? How do I determine my draw length? There is no rest on my bow, Where do I put the arrow? How do I pick a bow for me? How do I know which size armguard I need? How do I string my new bow? First I encourage you to read the care instructions that came with the bow as this will answer your question as to what method to use. The step-through method a.k.a the Traditional method (shown below) or a bow stringer (for a longbow) is the safest way to string it. If you do Not know how to do the step-through method or use a bow stringer please visit your local archery shop and have some one show you how. Below is an example of the step thru or traditional method. Many of you may already know this method and not realize it or call it something else. But PLEASE have someone show you how if you have never done this. Where can I find arrows for my bow? I offer arrows on my archery accessories page. You can also find arrows at most archery supply stores that carry traditional accessories, Academy, Out Door World, etc. Just to name a few. Not all locations carry arrows all year. It will depend on you location and time of year on how easy it will be to find arrows. You will also need to match the spine weight (stiffness of the arrow) to your bow!! The spine weight of your arrow should be 5 - 10# lighter than your bow if using an unbacked longbow**. (ex: if your bow is 35# @ 28", the spine weight of your arrows should be 25# to 30#) On a backed bow (ex: Bamboo backed Osage or Hickory back Cherry) you will go 5# lighter or match the draw on the bow. So if the bow is 45# then you would want 40 to 45# spined arrows. The reason for matching the spine weight of your arrows to your bow, is so that you get the max. performance out of the bow. Arrows that are to heavy (heavier than your bow) will end up mostly in the ground. Arrows that are too light (spine weight Lighter than recommended for your bow) will not fly straight, they will wobble too much in flight. **On Recurves (true recurves) the spine weight should be 5 - 10# heavier to compensate for the force in which the arrow is discharged, as it loses an arrow faster. Arrows should be inspected for crakes or abrasions before each use. Do Not use damaged arrows!! Arrows should have the base of the feathers (fletchings) wrapped at the bottom (1/4" of the feather and about 1/2" of the shaft just below the feathers) of the feathers with thread, sinew, or tape to prevent them from sticking into the hand. (when there is not a shelf / arrow rest on the bow being used). Feathers will cut the hand, please consider using a glove or buying arrows with vanes. Why doesn't the string fit, it seems too long? Who is the maker of my earrings ? 99% of the Jewelry (earrings, necklaces, barrettes, hair pins, hair quills etc.) Are hand made by S. Yeager (me) a*k*a "Lady Kee" hence the name of my business Kee's Traditions. I hand make every piece so each is unique and will be slightly different from others that look similar to it. Returns are only on a per item/customer basis. Please see my Policies page for details on warranty and return policies as the policies vary per group of items. Please see out Contact Page, We will keep a list of upcoming events posted there. If there is not anything posted, we do not yet have any events planed. Policies and regulations vary by state and sometimes county. Below is the regulations for the state of Texas. Only the archery and crossbow equipment prescribed in this section may be used for taking game animals or game birds. Crossbows are not lawful for taking migratory game birds. The prescribed archery and crossbow equipment may be used during any general open season. Archery and crossbow equipment may not be used to hunt deer during the Muzzleloader-Only Deer Season. It is unlawful to be in possession of a firearm while hunting with a broadhead HUNTING point during the Archery-Only season, except a person licensed to carry a concealed handgun in Texas may carry a concealed handgun. NOTE: A firearm may be possessed in camp, in a motor vehicle, or while hunting lawful game other than whitetail or mule deer and turkey (e.g., exotics, feral hogs, squirrels). Nongame Animals: Archery and crossbows are lawful for non-protected nongame animals. must have a 35**-(pound, lbs.) minimum draw weight at 28 inches of draw at the time of hunting, when used to hunt turkey and all game animals other than squirrel. Any person may use a crossbow to hunt game animals or game birds (except migratory game birds) during a general open season or Eastern spring turkey season. Telescopic sights are lawful. ONLY a person with an upper-limb disability* may use a crossbow to hunt deer and turkey during the Archery Only Open Season, provided the person, while hunting, has in their immediate possession a physician's statement certifying the extent of the disability. 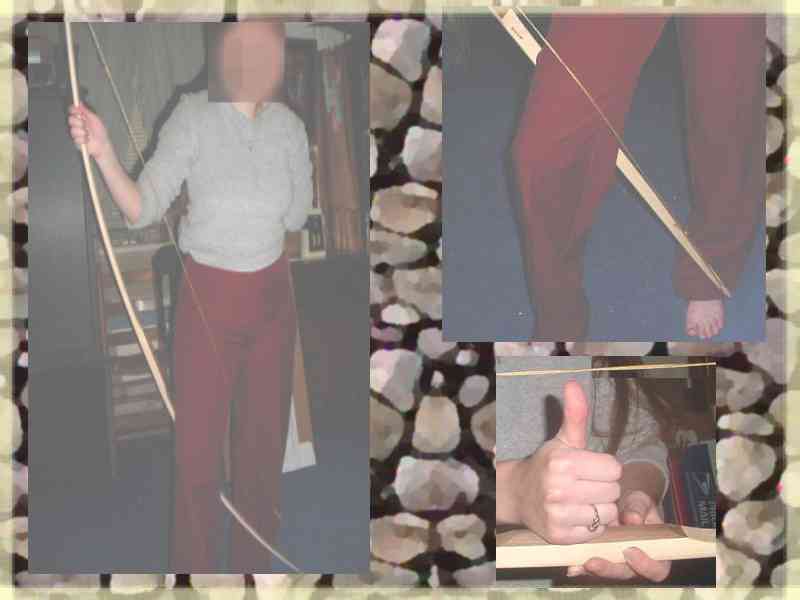 *An upper-limb disability is a permanent loss of the use of fingers, hand, or arm in a manner that renders the person incapable of using lawful archery equipment. the crossbow stock is not less than 25 inches in length. While hunting game animals and game birds, a projectile may not be poisoned, drugged, or explosive. When used to hunt turkey and all game animals other than squirrels, a projectile must be equipped with a broadhead hunting point that is at least 7/8-inch in width (upon impact) and has a minimum of 2 cutting edges. A mechanical broadhead must begin to open upon impact and, when open, must be a minimum of 7/8-inch in width. An archer may have arrows or crossbow bolts with field, target, or judo points in the quiver with the broadhead hunting points. You need a tape measure or a dowel that has been marked at every inch, make a fist with you left hand hold it straight out to the side and look toward it. Measure from your fist to the corner of your mouth (your right hand should be anchored at your mouth) Draw the tape measure as you would an arrow. What ever the measurement is; that should be your draw length. (follow the instructions in reverse if left handed). 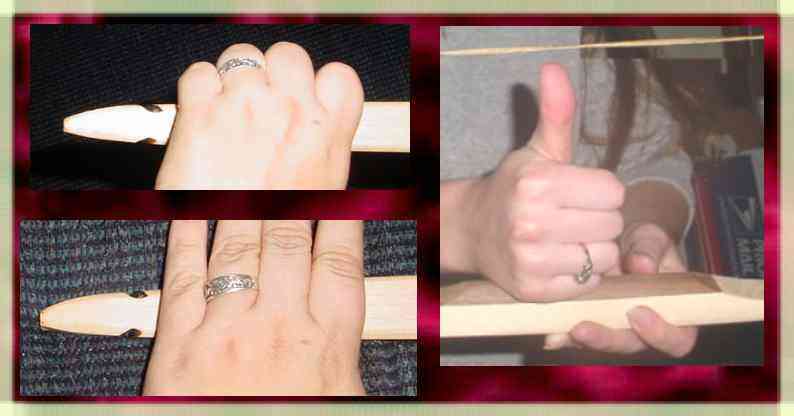 When shooting traditionally; they shot off the hand (knuckles). If you are shooting this way or intend to just remember that if your right handed the arrow will rest on the left hand side of the bow (visa versa if your left). Make sure the fletching* on your arrows are good. Also it may be a good idea to wear a leather glove or hand guard when shooting this way; if possible. Well first you will need to answer a couple of questions. Depending on your answers depends on what you should be looking for in a new bow. If your just hunting hay bails you really don't want more than 40# (lbs) any thing over that and you really start tearing arrows up, you'll put them completely through your target and start stripping feathers of at anything less than 20 yards. Most people go with 30# to 35# if all they are doing is recreational target shooting. Combat Archery: Please check your local groups weight limits. Here in the Kingdom of Ansteorra (SCA Texas) the weight limit for CA is 30#, Amtgard in my region is 35# and most of the LARP groups its 25# all weights @ 28" max draw. If you are hunting live animals, please check your states minimum requirements to hunt with a bow. Weight requirements vary according to state (occasionally region) and the type of game you are hunting. 35 to 40# is legal in most states. But several states require 45 to 50# min. What is your draw length? This to will determine what is available. Most people have a 27 to 28" draw. If you don't know your draw length please click the following link to see How do I determine draw length . Once you have determined what weight you are looking for and what draw length you need. Do you shot occasionally, but don't really have a lot of time to shot? Just getting into it. or Shoot Combat Archery? You will probably want to go with an un-backed (non- laminated bow) Its a great place to start and you don't have to spend a bunch of money to have fun. If you shoot CA you won't cry as bad if someone stomps your bow or your forced to take a hit while holding it. Remember these are just guide lines to help you determine what you may be looking for, feel free to drop us an e-mail and as questions. We will gladly help you figure out what you need or want even if its not from us! How do I know What size armguard I need? To determine if it will fit you, you will need to look at the measurements. then around the forearm in that location. Your arm will need to be the same size or larger that the measurements of the arm guard for it to fit and work properly. As if its too big it will gap and if it gaps, the string will catch the gap and will hurt more than if you wore no guard at all. Copyright © 2006-2008 Kee's Traditions. All rights reserved.